Disclaimer: I received this as an ARC in exchange for an honest review. Baba Ali is an apprentice to Charles Babbage in England, famous for his modern inventions. One day Ali receives a clockwork box, which marks he journey back to his homeland. What he doesn't know is that it will be fraught with danger and grief. Yet Ali will gain knowledge, strength and love as well. This is the tale of Baba Ali and his quest to save a legacy, and possibly his life. 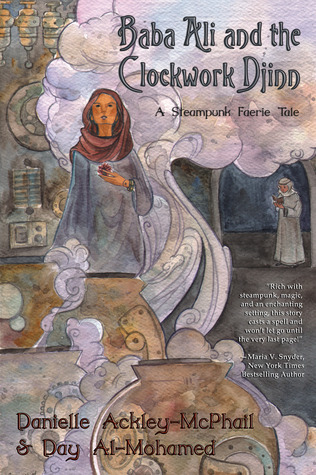 Baba Ali and the Clockwork Djinn is the type of novel I didn't think I'd ever read, but the premise sounded interesting and different so I figured why not. Little did I know, it's actually a retelling of Ali Baba and the Forty Thieves, only I didn't realise until halfway through the story. In fact, I wasn't fully engaged with what was happening until the last half kicked in. That's when I felt like the story really made sense and the characters had some sort of purpose. It wasn't that the plot was slow, more so that the first half was only a build up - necessary but not overly interesting. It did take me awhile to get past all that. Still, the second half really made up for my lack of interest, with the action and fantasy elements becoming a larger focus. At first I was really confused with all the inventions and technologically advanced objects, which I didn't expect to see in this setting, but once the magical factors also made an appearance everything smoothed out. I really liked the mapping of the settings, especially the cave where Ali finds in the desert - much like the original story - and his own homeland. It carried a really mystical and mysterious tone, perfect for where the plot was heading. The characters were decent, although only Ali stuck with me, whilst the villains were pretty typical and one-sided. Yet, I could actually imagine them as characters in a Disney/animated movie and this entire story could be made into one, if it wasn't so violent and had less mature content. It was an interesting read, with great writing but ultimately, I couldn't really get into it as much as I would have liked to. I think my reading experience really influenced this, because I was reading this as an e-book, so it felt like the story was going on forever. In print format it's actually on around 200 pages long, but I just kept feeling like I wanted it to end. I enjoyed it more in the last half and I appreciated it for the meaning and lessons it left. I think I am part of the minority with this view though as Baba Ali and the Clockwork Djinn has an average of 4.45 stars on Goodreads, so definitely check it out because I might be for you!